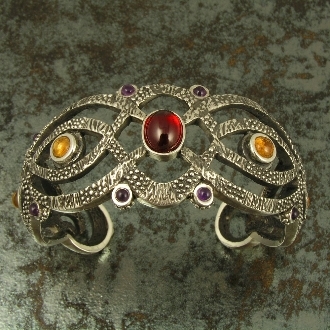 Sterling silver cuff bracelet with amethyst, garnet and citrine cabochons. Our Products >> Silver bracelet with amethyst, garnet and citrine cabochons. Unique handmade sterling silver cuff bracelet with amethyst, garnet and citrine cabochons. The center stone is an oval 3.8ct. Mozambique garnet cabochon flanked by 4 round glowing yellow citrine cabochons totaling 2.8cts. The outside edges are adorned by 8 purple amethyst cabochons totaling 1.68cts. The silver has been oxidized to provide more contrast between the highly polished areas and the darkened recesses in the design detail. The oxidized silver also gives the bracelet a nice soft antique look. Many other colored stone choices could be set in this bracelet. Special orders are welcome! Mozambique garnets are known for their high quality and warm, red colors. Mozambique garnet is a mixture of pyrope and almandine garnet, similar in color to rhodolite garnet, but slightly more red, and darker. Garnets are often worn to relieve inflammations of the skin and its powers include healing, strength, and protection. It is also believed to regulate the heart and blood flow and aid in curing depression. Citrine is a variety of quartz ranging in color from yellow, yellow-brown, orange, dark orange-brown and reddish-brown. Citrine is often found in association with amethyst, but it is much rarer than its purple cousin. Citrine is warming, energizing and imparts a flexibility and openness to new experiences It has the power to impart joy to all who behold it and instills a positive attitude. Gloom and negativity do not exist around the citrine. Citrine supports generosity, helps you hold onto your wealth and draws all the good things in life to you. Amethyst boasts the color of royalty, a rich violet-purple and is the most highly prized variety of quartz. Amethyst is cleansing, both physically and psychologically. It helps promote internal balance, harmony and stability. Amethyst also helps sharpen the conscious mind and enhances one's mental powers. It is used to improve memory and keeps thoughts in line with life goals. Amethyst is the stone of pure, true, emotional love.